Taking part or going to watch the Great North Run? Here is all you need to know about Metro travel to and from this year’s event. The Great North Run is the busiest Sunday of the year for Tyne and Wear Metro and this year the run is expected to have about 57,000 runners as well as thousands of spectators lining the route. There will be frequent trains before and after the Great North Run that will get you to and from this year’s event. We are advising runners and spectators to leave extra travelling time, buy their tickets in advance and be prepared for long queues and waiting times. Will there be frequent trains to get to and from the Great North Run? Yes. There will be a train every seven and a half minutes to and from South Shields until the early evening. There will be about eight trains an hour leaving South Shields after the run. What stations are best to use? The nearest station to the start of the run is Haymarket in Newcastle city centre; about a 15 minute walk to the start line. The nearest station to the end of the run is South Shields; about a 15 minute walk from the finish line. We recommend that you plan your journey well in advance and aim to arrive early at your destination. To avoid queuing at the ticket machines on the day we are encouraging customers to buy a Great North Run Metro ticket in advance. Special Great North Run tickets are available in advance from any Metro station ticket machine by selecting GN Run 9/9 Adult (£5.10) or GN Run 9/9 Child (£1.30) from the main screen. 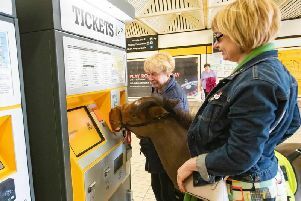 Our ticket machines accept debit/credit cards as well as notes and coins. Alternately, Great North Run wristbands are available to buy from Nexus TravelShops at the pop-up ticket shop at Great North Run Pasta Party on Saturday 8 September, and online at www.sales.nexus.org.uk/great-north-run-metro-wristbands-1 (until end of the day Sunday 2 September). New for 2018, if you’re taking part in or watching the Junior or Mini Great North Run or Great North 5K on Saturday 8 September you can purchase an adult and child wristband to make your journey there and back even easier. The wristbands are only available to purchase online. Yes. There’s free parking on Sundays (small fees apply other days) at the following Metro station car parks: Callerton Parkway, Bank Foot, Kingston Park, Regent Centre, Four Lane Ends, Northumberland Park and Stadium of Light. More car parking information is available from www.nexus.org.uk/park. Please note car parks will be busy. There will be road closures in place along the route, so please plan your route to and from the car parks in advance. Will Metro stations be busy before and after the Great North Run? Yes – services are expected to be very busy from early morning and throughout the day on Sunday 9 September. We recommend that you plan your journey in advance and aim to arrive at your destination early. Staff will be available for advice and assistance; they’ll be highly visible in orange jackets. Before the run, staff will be present at: Haymarket, Monument, Central Station, Gateshead, Gateshead Stadium, Felling, Heworth, Pelaw and South Shields. Will there be queues to travel on Metro after the run? Trains from South Shields after the run will be very busy and queuing systems will be in place. There will be two queues, both of which are for Metro trains to all destinations. The queues will be long so please be prepared to wait before being able to board. Please listen for station announcements and guidance from our staff. If you’ve bought a ticket in advance please have this handy when in the queue. If you need to buy a ticket, staff will be selling them while you queue. The Shields Ferry runs between South Shields and North Shields (from 8.45am until 6pm). Queuing systems will be in place. Will there be any station closures on the day? Haymarket – No entry into the station (exit only) from about 8.00am until the start of the run at 10.40am, please use Monument instead. Jesmond and Manors – Closed from 10.40am until the early afternoon. Please use Haymarket or Monument instead. Chichester – Closed from 1.00pm until early evening. Please use South Shields instead. Staff will be at stations to assist and please note closure times may vary on the day depending on the operational requirements. Check www.nexus.org.uk/metro, or our Twitter feed @My_Metro for the latest information and live updates. Do you have advice for runners taking part in the Great North Run? Yes. If you are taking part in the run we advise that you leave extra travel time to get to the start at Haymarket, trains will be very busy from early in the day. Remember to stay hydrated before, during and after the run. Trains will be busy – if train windows are closed, open them to help keep cool. Do you have any advice for spectators travelling to the Great North Run? Yes. We recommend that if you’re planning on supporting friends and family taking part in the Great North Run, to choose one location to see them – either setting off at the start in Newcastle city centre, at a midway point or at the finishing area in South Shields. The busiest times for spectators travelling to the finish line will be between 11am and 3pm. Travelling on Metro with a pushchair on Great North Run day will be very difficult due to the number of people travelling on the network. Remember to stay hydrated before, during and after the run. Trains will be busy – if train windows are closed open them to help keep cool. If you intend to travel on Metro and you have a charity balloon, please ensure the string is secure, kept short and you have a tight hold of it at all times. To help plan you journey call 0191 20 20 747 (open Monday to Friday 8.00am to 6.00pm), use the Live Travel Map: http://livemap.nexus.org.uk/#/liveDepartures or visit www.nexus.org.uk/metro/greatnorthrun. Runners and spectators can get all the latest travel updates from our Twitter page: @My_Metro and our official Tyne and Wear Metro app.